A 4 mile circular walk described from the War Memorial (bus 93 from Wimbledon Station - also served by District Line & Tramlink). There is an optional extension to the Windmill (extra 1½ miles) across the Common (which can be muddy!). The walk can be added to the Wimbledon (Park side) route. Instructions are given on this page. 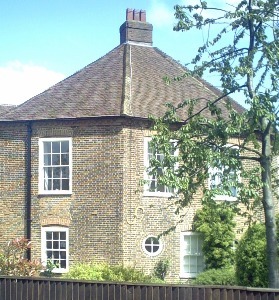 There are attractive cottages of the 1840s on an encroachment of the common. The area opposite was cultivated as allotments in WWI. This is open on weekend afternoons in summer. The cafe adjacent is open daily. William Wilberforce School occupies buildings of the old charity school established in 1758-61 [pix]. There are modern almshouses on the site of the parish workhouse. The Fox & Grapes pub (with a panelled interior) opened in 1787 and was extended into former stables. There are some large houses here including Cannizaro Park which was rebuilt after a fire in 1900. It served as a convalesent home during WWI then a retirement home before becoming a hotel. The grounds are now a public park which is well worth a visit. There is a map at the entrance. This would have been another encroachment on the common of workmen's houses with two pubs. The Crooked Billet was first recorded as an inn and brewery in 1509 on the property of Thomas Cromwell. The present pub was formed from a late 18th century house with an adjoining mews cottage.The Hand in Hand has been licensed as a pub since the 1870s and is composed of two pairs of early 19th century cottages, one of which was originally a bakery. The Cinque Cottages (almshouses) have been rebuilt. Opposite is Southside House of 1687 (open for tours). Left along Woodhayes Road (towards Kings College School). Right at Wright's Alley just before the school buildings. Kings College School was founded in 1829 and moved from central London in 1897. This is an ancient trackway. Wimbledon College was founded in 1860 and has buildings designed by SS Teulon. Later additions include a hall (burnt down in 1977 and rebuilt 1980), a chapel of 1910 and a gymnasium of 1883 (converted to a library in 1980). The RC Church of the Sacred Heart was built in 1886-1901. In Worple Road to the right the Wimbledon Croquet & Tennis Club was founded in 1868. St John's Church to the right was designed by TG Jackson. There are stables by the Swan pub. This and the King of Denmark were built c1860. The common area at the end of the road was used as a POW camp in WWII. Go right along Southside Common. The coach house of Lauriston House has a plaque to William Wilberforce. The crescent at Murray Road was the entrance drive of Wimbledon Lodge (demolished 1905). Number 1 is by Aston Webb, number 2 by EJ May and number 7 by Ernest Newton. Oldfield Road to the right has attractive c1820 cottages. The former village hall on the left hand side (designed by SS Teulon in 1858) houses the Local History Museum (open weekend afternoons). At the end of Ridgway go right at Wimbledon Hill Road to complete the combined route. Go left into the High Street to complete the Common side circuit. The Nat West Bank was built in 1895 and the fire station in 1890. Further along on the right is Eagle House built in 1613 for a founder of the East India Company but now the offices of the Islamic Heritage Foundation. The Study for girls moved here from the High Street in 1903. Left at Parkside Avenue. Cross Parkside and take the path parallel to this road to the left back to the War Memorial. For the combined route follow instructions from the top of the page.